BumpOut is a motorised speaker you can stick to anything | What Hi-Fi? The BumpOut is a Bluetooth speaker that can stick to any surface, expanding its driver casing in a bid for better bass and improved audio quality. Listening to people playing music from their phones, you might think that the last thing anyone needs to do is encourage them... Well, BumpOut disagrees, having been inspired by kids "after school playing music on their phones that it appeared they couldn’t really hear". 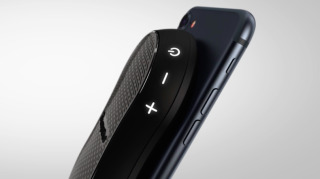 The Bluetooth speaker is apparently the world's first to have "Motorized Expansion Technology" - the driver's casing expands in an attempt to increase audio quality and bass performance - while still being small enough to fit in a pocket. And using the adhesive 'BumpOut Coin', which slots into the back of the device, you can stick the speaker onto the back of your iPhone 7 (or iPhone 8). It's not likely to be bothered by dirty pockets, either; the speaker is water and dust resistant, so you can stick it in your bathroom without a worry. It can also connect to other BumpOut speakers and has a built-in microphone, all powered by a Lithium-ion battery said to be good for seven hours of use. While it's probably not going to have the best sound quality, a Bluetooth speaker you can securely stick pretty much anywhere is at least worth a look. And it'll be pretty cheap. You can back the BumpOut on Indiegogo for $59.